Home / School of Liberal Arts / English / Matthew Zapruder on Monday's Here and Now "Does Teaching Poetry Get In The Way Of Enjoying It?" 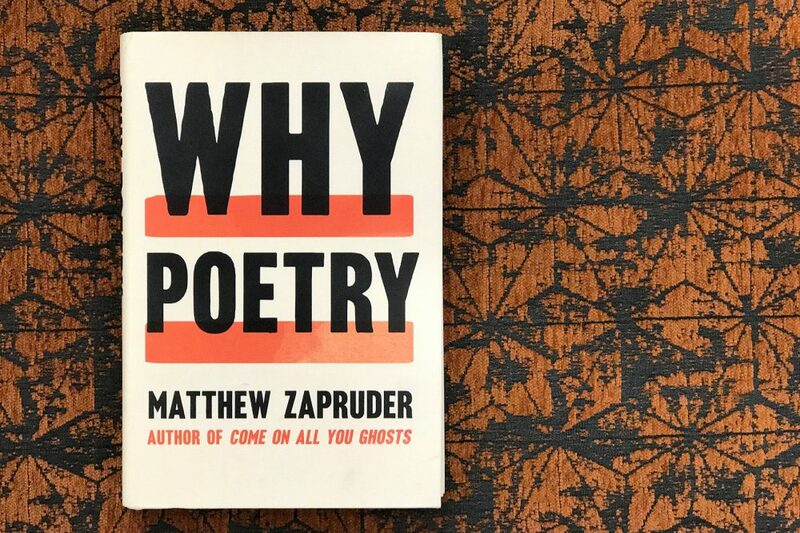 Poet and Saint Mary's professor Matthew Zapruder (@matthewzapruder) says that the way that poetry is taught often gets in the way of enjoying and understanding it. He writes about ways to look at poetry anew in "Why Poetry," and joins Here & Now's Meghna Chakrabarti to discuss the book. When I was first starting to write poetry, in my early 20’s, I didn’t really understand much about it. I hadn’t been an English major in college, nor had I read much American poetry. So I felt simultaneously thrilled, destabilized, and confused. I felt sure there was meaning there, somewhere. I could feel it. But I also often doubted myself, and felt like I was looking in the wrong place, or missing what was really important. At that time, I had the vague impression that poets used poetic language and techniques to express important thoughts or ideas in a more beautiful or complex or compressed way than prose. That is, there was something about the level of language, its beauty or complexity or heightened qualities, that gave a piece of writing the status of poetry, and distinguished it from prose. The more poetry I read, and wrote, the more clearly I saw that there really was no such thing as “poetic language.” The words in poems are for the most part the same as those we find everywhere else. The energy of poetry comes primarily from the reanimation and reactivation of the language that we recognize and know. I noticed there were, of course, ideas in poetry, but they always seemed just out of reach, somehow both important and also in a way not, or at least not most important. Focusing just on those ideas, and trying to say what a poem was “really” about, always felt reductive, as if whatever was most important was being left behind in the act of explanation itself. Poetry seemed to be more about something else, something like creating a different sort of mood, or mental space, or way of thinking. Ludwig Wittgenstein wrote, “Do not forget that a poem, al- though it is composed in the language of information, is not used in the language-game of giving information.” Poetry isn’t merely a more beautiful way to communicate ideas or experiences or feelings: prose, after all, does that, and can be just as beautiful as poetry too. If not to give information, what is the language of poetry for? What does it do that is different than prose? And why, as readers and writers, do we return to it, and preserve it? The concept of genre—a defined category of writing, like poetry or novels or plays—isn’t currently fashionable. Many people find such categories too restrictive and fussy. Much of the energy of contemporary literature is in crossing and mixing various genres in single pieces of writing. Yet when it comes to poetry, it can help to think about genre in a more isolated way, at least temporarily, because the question of genre is really a question of purpose: Why did the writer choose a certain type of writing, and how does that choice affect how we should read the work before us? We don’t usually need to think about why we are reading some- thing. Usually, we have an immediate, intuitive sense of what it is for, and therefore how to read it. Without needing to be told, we understand the difference between reading a novel and reading the newspaper. We know we should be looking for something different in each of those experiences. Stories and novels create characters and situations and tell stories; journalism communicates information; essays engage in that hard-to-categorize effort to explore, however loosely, a certain idea; editorials and sermons tell us what we should and should not do, and believe; and so on. No one can seem to tell us why poems are written, what they are for. Why are they so confusing? What are we supposed to be looking for? And what is the point of rhyme, of form, of metaphor, of imagery? Is it somehow to decorate or make more appealing some kind of message of the poem? What is the purpose of poetry? on the reader will take only a few minutes. In a few minutes the reader will receive his shock from discoveries, connections, glimmers of expression that have been accumulated during months of research, waiting, patience, and impatience. The poem makes poetry happen in the mind of the reader or listener. It happens first to the poet, and in the course of writing, the poet eventually makes something, a little machine, one that for the reader produces discoveries, connections, glimmers of expression. Whatever it does it can do again and again, as many times as we need it. I like this answer too because, like Valéry’s definition, it distinguishes poetry from other forms of writing not by any particular formal quality—like rhyme, or line breaks, or musicality, or the use of imagery or metaphor—but by its effect. Her definition is functional and empirical, passionate and subjective: I know poetry, say Dickinson and Valéry, because of how it makes me feel, what it does to me. How poetry creates the poetic state of mind in a reader is the central question of this book. It happens through the form of the poem, which guides the mind of a reader. It happens through leaps of association. And it happens as the poem explores and activates and plays with the nature of language itself. Poems exist to create a space for the possibilities of language as material. That is what distinguishes them from all other forms of writing. Poems allow language its inherent provisionality, uncertainty, and slippages. They also give space for its physicality—the way it sounds, looks, feels in the mouth—to itself make meaning. And poems also remind us of something we almost always take for granted: the miraculous, tenuous ability of language to connect us to each other and the world around us. The elusive, quick-silver, provisional nature of language is by necessity suppressed in ordinary conversation, as well as in most other writing. What makes a poem different from any other use of language is that it remains the sole place designed expressly to make available those connections that are hidden when language is being used for another purpose. Language waits to be released in poetry. Poetry enacts the possibilities and powers that lie dormant in the nature of language itself. Poems are where contradictions and possibilities of the material of this meaning-making system are deliberately brought forth and celebrated, ultimately undistracted by any other overriding purpose. Unlike other forms of writing, poetry takes as its primary task to insist and depend upon and celebrate the troubled relation of the word to what it represents. In following what is beautiful and uncertain in language, we get to a truth that is beyond our ability to articulate when we are attempting to “use” language to convey our ideas or stories. Poetry takes this inherent limitation of the material of language—that words are imprecise in their relation to whatever it is they all-too-imperfectly denote—and turns it into a place of communion. Remarkably, impossibly, miraculously, we somehow manage to communicate and mean despite the imperfect instrument of language. In this way, the provisional, tenuous, exciting, fragile, imperfect, yet intensely pleasurable relationship of a poem to language, and to meaning, could be said to be a kind of metaphor for our own relation to language, the world, and each other. There can be both sadness and joy in this recognition of the human condition. It could be said the relationship of poems to what we intuit but can never fully say makes them like prayer, that unending effort to bring someone closer to the divine, without pretending the divine could ever be fully known or understood. When we are attentive to the language of poetry, to the words we see before us in the poem, we start to get a glimmer of the actuality, the paradox and complexity and uncertainty, that lies behind the way we usually perceive the world. Words and ideas can loosen and break free for a moment, so we can experience them anew. The power of the activated material of language in poetry can only fully be pursued when the writer is not ultimately preoccupied with any other task, like storytelling or explaining or convincing or describing or anything else. In their poems, poets do those things, but only as long as it suits them. A poet is always ready to let them go. Every true poem is marked, somewhere, by that freedom. And that choice to be ready to reject all other purposes, in favor of the possibilities of language freed from utility, is when the writer becomes a poet. Excerpted From WHY POETRY by Matthew Zapruder. Copyright ©2017 Matthew Zapruder. Reprinted by permission of Ecco, an imprint of HarperCollins Publishers. This segment aired on August 21, 2017.